Lake Forest Academy is a coeducational private boarding traditional school for students in grades 9 through 12. Founded in 1857, Lake Forest Academy is a coed, boarding and day school serving 390 academically bright and motivated students. The Academy is located in a National Historic Landmark 30 miles north of Chicago on a 150-acre wooded campus. The Academy offers a challenging curriculum focused on academic excellence and characterized by small classes and close faculty/student interaction. The community provides the support and caring needed to develop confidence and strong values and makes learning a constant adventure. 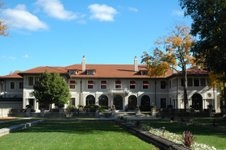 Lake Forest Academy is located on a beautiful 150 acre wooded campus in the northern Chicago suburb of Lake Forest. The campus features academic buildings, residence halls, a gymnasium and ice hockey rink, playing fields and faculty homes.LFA's mascot is the Caxy, which is ancient Greek for the croaking sound made by a frog.75% of the Faculty live on campus and the majority of our faculty members have graduate degrees.Lake Forest Academy offers 24 Advanced Placement courses, 23 varsity sports, and a wide range of artistic options.100% of our graduating seniors matriculate to college.LFA graduates attend the best colleges in the country, including Harvard, Princeton, Brown, Duke, Dartmouth, Columbia, George Washington, Georgetown, Cornell, Middlebury and Wesleyan, Northwestern, University of Chicago, UCLA, Williams, as well as many other excellent colleges and universities.Many extracurricular opportunities are offered, including more than 30 student-run clubs, newspaper, yearbook, student dances, and many trips off campus to places like Chicago and Milwaukee.Lake Forest Academy is a diverse community - we have students from all corners of the globe. 27% of our students come from outside the United States.The LFA student body represents 16 states and 22 countries.We are committed to making this education affordable. 31 percent of the student body receives financial aid ($2.8 million awarded annually).Important Traditions at LFA:Move-Up DayMove-Up Day began as a tradition at Ferry Hall in 1906, originally called Ivy Day, commemorating the annual planting of Ivy at the base of Smith Hall. Over time, this tradition evolved into its current form, usually being held the day before Graduation. Departmental awards and speeches are given, and at the end of the ceremony, each class is invited to "move up" and literally take the place that they will occupy the next year: seniors move to sit with the alumni, juniors take the former spots of the seniors, and so on.All-School HandshakeAt the beginning of each year every student, faculty member, and administrator gathers in the formal gardens and participates in the all school handshake. 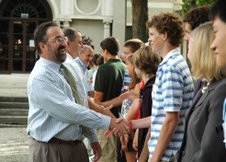 The entire school arranges themselves in a line around the periphery of the Formal Gardens and the Head of School begins by shaking the person's hand next to him. As he moves down the line the next person shakes his hand, and the next, and the next. The procession behind the Head Master snakes around until every member of the school shakes the hand of everyone else.The House CupThe House Cup Competition was established under Dean Colley Bell in 2004. The students are divided up into four houses (Lewis, Sargent, Welch, and Bird) and compete in various events throughout the year. The house with the most event points at the end of the year gets their name inscribed on a trophy that is located in Reid Hall, and the colors of their team are used in the student handbook. SSAT and the average admitted student scores in the 74th percentile. Lake Forest Academy's relatively even enrollment profile may offer insights into student retention rates, local population changes, real estate costs, and the accessibility of alternative educational options. to find out more about the specific factors influencing Lake Forest Academy's enrollment numbers. 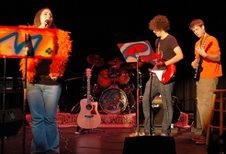 Want more info about Lake Forest Academy? Get free advice from education experts and Noodle community members.